Whats better than taking the family out for barbecue, watch some games on HDTVs and the kids eat free? Every weekend at Big Racks BBQ and Sports Grill in Grapevine, that happens. Award winning barbecue, friendly staff, and kids eat free. Oh I almost forgot all the HDTVs and big screen HDs. March Madness is coming! Heat the oil in a large skillet over medium-high heat for 1 minute. Reduce the heat to medium and add the onion, cooking until it’s soft and a little brown around the edges, about 5 to 7 minutes, stirring often. Stir in the guava paste, tomato paste, vinegar, brown sugar, star anise, allspice, and curry powder. Simmer until the guava paste has melted, about 15 minutes, stirring occasionally. Turn off the heat and let the sauce cool slightly. Discard the star anise; transfer the mixture to your blender and puree. With the motor running add the lime juice and rum. Transfer to a small bowl and set aside, or refrigerate for up to 2 weeks. Whisk the olive oil, garlic, lime juice, salt and pepper together in a large bowl. Add the mangoes, peppers, red onions, chile, and cilantro and toss to coat. Add the beans and gently toss everything together. Heat your broiler to high. Line a large baking dish or rimmed baking sheet with a double layer of aluminum foil and grease the foil with some olive oil or nonstick cooking spray. Place the salmon in the prepared baking dish and tuck about 2-inches of the tail end under the fish, so you have a somewhat uniform shape. Pour the barbecue sauce over the salmon and cook it under the broiler until the sauce caramelizes and chars around the edges and the salmon is firm and flakes easily, 8 to 12 minutes for rare (the salmon will still be pink in the middle) or 12 to 15 minutes for well done (the salmon will be cooked throughout). Every weekend at Big Racks BBQ and Sports Grill in Grapevine, kids eat free. 1 Spray grill rack with nonstick spray. 2 Preheat grill to medium or prepare medium fire using direct method. 3 In the meantime make the gremolita by mixing together parsley, zest, garlic, oil and cumin in small bowl. 4 Reserve 3 tbsp of gremolata in cup. 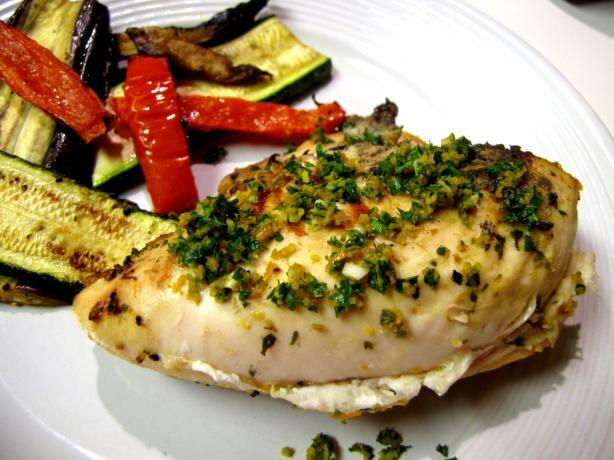 5 Gently loosen skin on chicken and spread remaining gremolata on meat under skin. 6 Place chicken, skin side down, on cooler portion of grill and cover. 7 Turn every 10 minutes, until cooked through (about 30 minutes). 8 Remove skin from chicken. 9 Place chicken on platter and sprinkle with reserved gremolata.